Designed to quickly and easily transform your street car into a race legal competition car. This cage closely conforms to your cars interior, allowing quick entry & exiting. It uses precision fit, 6 mounting point, slip-tube and bolt-in design. 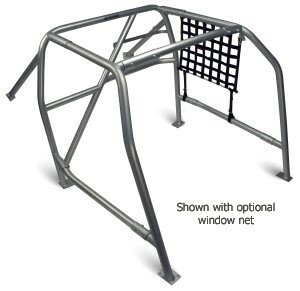 This cage is approved by SCCA and NASA for open road racing and drifting events. The best fitting pre-fab cage you can buy. All cages made to order. These cages are made to order, allowing for tube size and type to be selected. Most cages are made from 1.50 or 1.750 x .120 DOM steel.